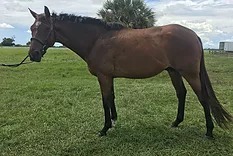 Getting Easier is a 7 yo TB Gelding looking for his forever home. 15.2+H. Very nice mover with a ground covering stride. Could easily do any discipline. Jumping small jumps and has a lead change.